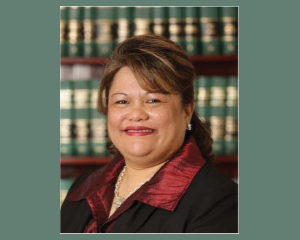 Chief Judge Frances M. Tydingco-Gatewood is pleased to announce the appointment of local attorney Cynthia V. Ecube to be the Ninth Circuit Lawyer Coordinating Committee Representative for the District of Guam, effective March 9, 2018. As the District of Guam’s Lawyer Representative, Ms. Ecube will work to improve the overall delivery of public service by the District Court of Guam by enhancing access to the court system and fostering open communication between lawyers and judges. As the primary liaison between the federal bench and the practicing federal bar, Ms. Ecube is tasked with chairing the annual district conference in accordance with national guidelines and will publish the Annual District Report for Guam and present that report to the Ninth Circuit. Additionally, Ms. Ecube will attend and participate in the annual Ninth Circuit Judicial Conference, and in the conference resolution process. She will also educate members of the bar generally about the conference and solicit their reviews. Ms. Ecube served as president of the Guam Bar Association (GBA) from 2009 to 2015 and prior to that, served as vice president of that organization for eight years. During her tenure as an officer of the GBA, she worked tirelessly on countless projects to advance the administration of justice and civic education, including helping to plan numerous Law Week events, continuing legal education seminars and annual district conferences. In addition, Ms. Ecube has served on several court committees, including the U.S. Magistrate Judge Selection Committee, the Federal Public Defender Selection Committee, and the General Local Rules committee, and the Committee on Discipline. Ms. Ecube has zealously served the interests of countless indigent clients as a member of the court’s Criminal Justice Act Panel since 1996. In 2015, the court bestowed the Cristobal C. Dueñas Excellence Award upon Ms. Ecube for her tireless service to the court and legal community.